It's time for a little hair hilarity! The Play-Doh barbershop toy is a tried and true classic, and this one comes in a convenient mini size for an easy and fun on the go activity that's even easier to store in small spaces. 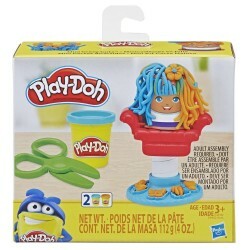 Grow and style silly Play-Doh hairstyles for your customer with the hair-growing chair, kid-friendly plastic scissors and razor, and 2 cans of non-toxic Play-Doh compound. Give toddlers and preschoolers a giggle break during their busy day or pack it in your bag to take along as a travel toy anywhere you've got a flat surface to play. • Includes unassembled barbershop playset, character thimble, scissors, razor, and 2 cans of Play-Doh Brand Modeling Compound. • CLASSIC MINI PLAY-DOH BARBERSHOP TOY – This hair-growing chair lets kids cut, shave, and style the silly little character's hair again and again, and it comes in a convenient small size. • COMPLETE CREATIVE ACTIVITY IN A SMALL CONVENIENT SIZE – Take a little time for some big creative fun with the kid-friendly plastic razor and scissors and 2 non-toxic Play-Doh colors in 2-ounce cans. • PERFECT FOR KIDS AGES 3 AND UP – Preschoolers and big kids alike can use their imaginations to make the wackiest hairstyles they can imagine. It won't take up much room in the toy box at home, and it's also a great distraction for parents to pack in a bag for an on the go activity.